On a mixed day of cold weather the Manchester Walking Football Over 65 Cup November 2017 kicked off with eight teams in two groups of four. 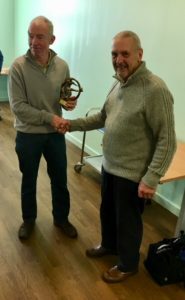 Along with our five local teams, AFC Blackpool Senior Seasiders, Hartshill Strollers from the West Midlands and Wakefield Wanderers joined us for this second over 65’s cup tournament, the first one played in June this year. 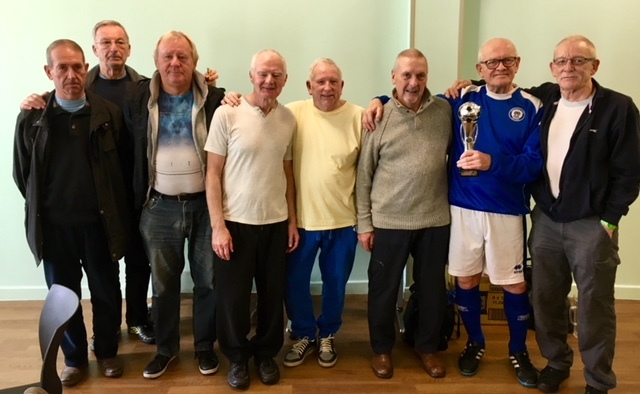 Eight teams in two groups of four played in a round robin format for this Manchester Walking Football Over 65 Cup November 2017. 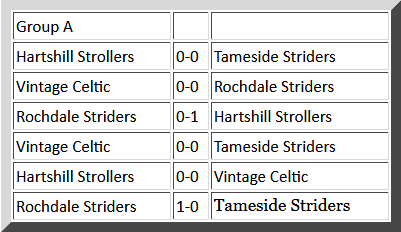 Group A consisted of Hartshill Strollers, Rochdale Striders, Tameside Striders and Vintage Celtic. In Group B were AFC Blackpool Senior Seasiders, Chadderton FC WF, Rochdale AFC Strollers and Wakefield Wanderers. In the round robin format eleven goals were scored, with only two in Group A, where there were four 0-0 draws. Only one game in Group B finished 0-0 and nine goals were scored in total. Hartshill Strollers headed Group A on five points, with Rochdale Striders in second place with four points. Chadderton came top of Group B with seven points followed by Rochdale Strollers on four points, just edging out Blackpool on a goal difference of one. In the semi-finals of the Cup Hartshill Strollers were drawn against Rochdale Strollers. The result was a 1-0 win for the Rochdale side, who were looking to retain the trophy they won in June. In the other semi-final Chadderton beat Rochdale Striders 2-0 to set up a local final with the other Rochdale team. The Cup final finished in a 0-0 draw and was won on penalties by Rochdale Strollers, who in the event did retain their trophy. The Plate semi-finals saw Vintage Celtic drawn with Wakefield Wanderers and at last Celtic found the net in a 2-0 victory. The other semi-final ended in a 0-0 draw between Blackpool and Tameside Striders. After a marathon eighteen penalty shootout the Striders came through to make the final. The shootout lasted almost as long as the match! In a keenly contested Plate final Vintage Celtic overcame their neighbours with a 1-0 victory. Despite only winning the consolation Plate prize, as manager, it was pleasing to see that we were the only unbeaten side on the day without conceding a goal. 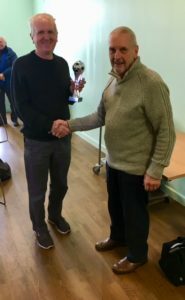 I think almost everyone would agree it was a very enjoyable Manchester Walking Football Over 65 Cup November 2017 tournament, played in the right spirit by all teams and that walking football was the winner. Video footage of some of the action can be found on the Tameside Striders website. Thanks once again to Paul Gardner who oversaw the day’s events and his colleague Barry Woodburn for his usual efficient registration duties. All the teams stayed for the presentation and after match buffet, and as was mentioned, a big thanks to the travelling teams Blackpool, Wakefield and Hartshill Strollers who had to make a 200 mile round journey from the Black Country. The raffle raised a total of £90 for the Stroke Association, thanks to all who contributed. It’s back to league action in three weeks time and it promises to be a tense affair with a number of teams contesting their respective divisional titles. It would be great to have a 70’s and over competition next year if enough interest could be shown. Top notch competition really well organised and so enjoyable. It’s a great way to exercise doing something we all love and meet like minded people. Great after match hospitality. Even the referees on the day were excellent. Great day with some great guys. Big thanks to Bill and Paul for their organisation. Roll on the next one, oh and the over 70’s. Still thinking about the tournament as I was hanging out the kit to dry today. The weather wasn’t as kind on Friday, but when the sun did shine albeit briefly there was still some warmth in it. The cold wind and the rain when it came did not deter those taking part. Everyone involved deserves great credit. What a great way for older men to get some exercise and reconnect with a football once again in a relatively friendly environment. Competition, but not ‘fierce’ competition. Win or lose you just can’t beat it. Thanks to all who took part, and to the organisers. An excellent & well organised tournament played in a very sporting manner. Good after-play hospitality & banter, too. Well worth the 200 mile, 5 hour round trip, almost! Thanks for a great day. Bob Haywood, Hartshill Strollers 65+ manager.